MAC valve is used to automatically shut off the air supply to the guiding system when recieving an electronic signal from the operator station (PLC), E-Stop or manual switch when the air supply to the guide is not needed. For centerline guiding applications the CG2 works in conjunction with other Coast Intermediate Guides to align the web’s imaginary centerline on materials with varying web widths. The moving Sensor Positioning Assembly can automatically adjust up to 20 inches of web width change and sensors will automatically retract when put into “auto-center”. Using state-of-the-art equipment, we can manufacture custom mounting stands to accommodate non standard guiding applications. All engineering and manufacturing is done on site which allows us to build a custom stand to fit your guiding needs. 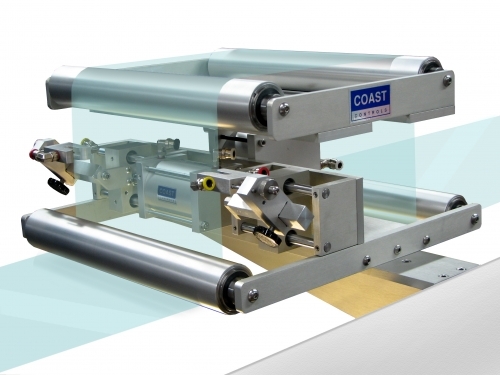 Whether it’s as simple as adding additional idler rollers or complex configurations, Coast can handle it. Larger Splice Tables are designed to be mounted independently and are used to firmly clamp the leading end of a new roll to the trailing end of a recently expired roll. 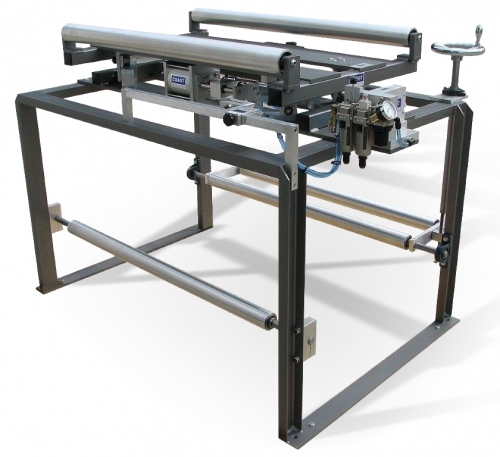 Large Splice tables include a heavy-duty mounting base that is welded and painted, an anodized aluminum table top and clamps, a replaceable stainless steel insert with a milled slot to guide the cutting knife or rotary blade, quad micro pneumatic actuators with independent toggle switch controls, variable speed adjustment for each clamp and independent cushioned clamping arms lined with rubber cork for an assured grip. Variable speed oscillating motor is used to offset “Gauge Band” buildup on certain guiding applications to prevent roll slippage. 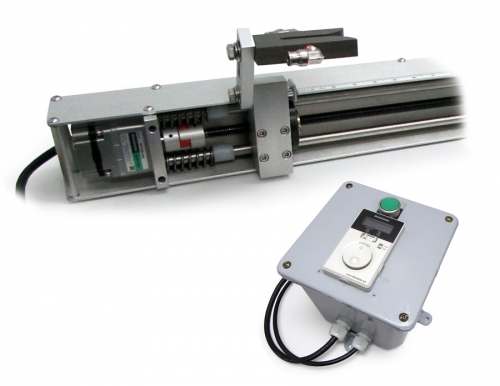 The electric motor combines 90 VDC accuracy with a 115 VAC Speed control. The fully adjustable cam arm gives you the ability to set the desired offset from 0 to 1” and anywhere in between. This combination results in a compact easy to use package capable of varying speeds from fast to slow with 0-1” of oscillation. Larger amounts of oscillation are available upon request. 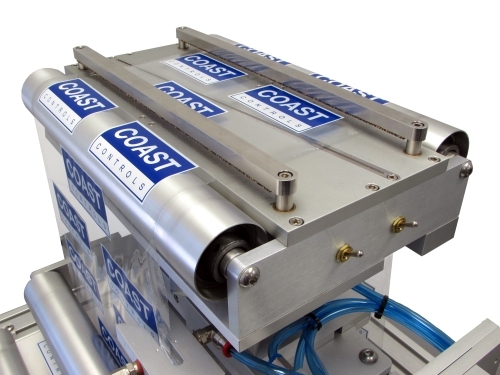 For guiding applications that requires placing the web guide into Auto-center during “web up” procedures from any remote location, Coast offers an electronic 3 way valve to place the guide into Auto-center. The electronic switch can be connected to a PLC or manually operated. For guiding applications in remote areas, a Remote Sensor can be used to change the sensor location to accommodate web width changes. The electronic switch can be connected to a PLC or manually operated. A Shifting Base can be installed to an existing stationary unwind allowing the unwind to move side to side for guiding purposes. NOTE: A roller needs to be attached to the shifting unwind to allow the web plane to remain the same as it passes through the stationary air sensor. 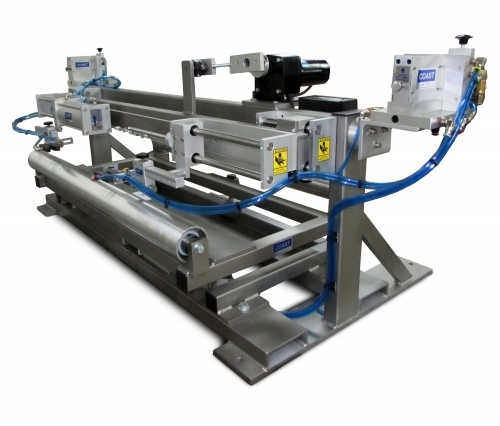 Splice Tables are designed to attach to a standard displacement guide or can be mounted independently and are used to firmly clamp the leading end of a new roll to the trailing end of a recently expired roll. Splice tables include an anodized aluminum mounting plate, a replaceable steel insert with a milled slot to guide the cutting knife or rotary blade, dual micro pneumatic actuators with independent toggle switch controls, variable speed adjustment for each clamp and independent cushioned clamping arms lined with rubber cork for assured grip. 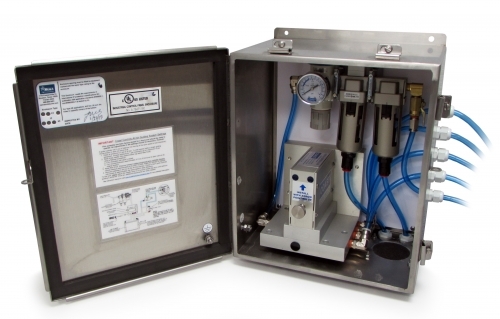 NEMA-4X vented industrial control panel enclosure is UL Listed and provides perfect protection for System Controls from harsh environments such as dirt, wash down, splashing liquids, and corrosive agents. This enclosure along with Stainless Steel guiding equipment is used in production areas such as food packaging applications.